The very first thing I want to cover in this tutorial series is how to make AI know when to jump when following a navigation path. This tutorial is using C++ approach. 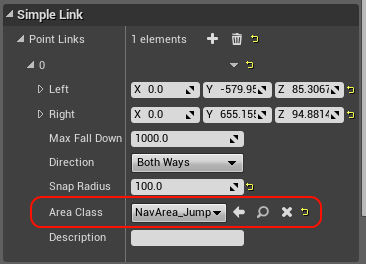 There's also an alternative way of achieving jump behavior, and that's by placing SmartNavigationLinks on the level, doable purely in Blueprint, but this will get covered in one of the upcoming tutorials. There are three steps required to achieve this tutorial's goal. One of the ways of annotating navmesh in UE4 is by applying navigation area types to it. There'll be a in-depth tutorial on navigation areas so I'll just say areas can apply a specific set of flags and costs to the navigation mesh. Next we need to configure our newly created area class by setting its AreaFlags. We do it in UNavArea_Jump's constructor. Compile, run, and that's it, jumping area is ready. 2. Implement a special path following component for detecting jump links. This is the most fun part. We need to create a custom path following component to handle jumping. We will reuse this new path following component in future tutorials, by the way. Remember you can find missing code details at tutorial's Github repository. This has to be done this way since PathFollowingComponent is the AIController's "sub-object pointer" which means we expect it to be set to an actual object instance all the time. One last thing that needs to be done to observe our AI enjoy its newly acquired jumping skill is to have some actual level with jump links. And keep the feedback coming!